A new Grove all-terrain cane introduced by Manitowoc for the global market offers unique innovations and class-leading capabilities in the taxi (road travelling) category. The four-axle Grove GMK4100L-1 boasts the best load charts in its class and its compact design makes it easy to access and manoeuvre on the narrowest of job sites. The new 100 t capacity crane replaces the GMK4100L and is part of a new generation of Grove taxi cranes. Grove was the first manufacturer to produce a 100 t capacity crane on four axles when it introduced the GMK4100L. Now, the new GMK4100L-1 has raised the bar even higher with some notable improvements. The GMK4100L-1 not only offers the best load charts in this class in its maximum counterweight configuration, but also in its most common taxi configuration with a weight of less than 12 t per axle (a common axle load limit in many countries). Compared with the GMK4100L, the new GMK4100L-1 delivers 6.9 per cent better load charts overall when in its 26.2 t maximum counterweight configuration. In the taxi configuration with a 6.7 t counterweight, the GMK4100L-1 boasts an increase of 9.3 per cent improved performance. The GMK4100L-1 is more compact than its predecessor, making it even easier to access narrow job sites. With 14-inch tyres, the crane boasts a 2.55 m width versus the 2.75 m of the GMK4100L. Overall it is also 0.5 m shorter, making it more manoeuvrable on congested job sites. The GMK4100L-1 is powered by a single engine, this reduces the weight of the crane allowing it to carry more counterweight which delivers superior lifting ability. The Tier IV Final/Euromot 4 Mercedes-Benz OM470LA is a six-cylinder diesel engine with a 320 kW rating at 1,700 rpm and a maximum torque of 2,100 Nm at 1,300 rpm. 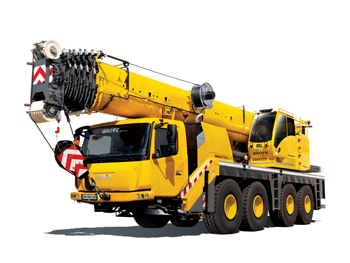 The crane is also available with an equivalent Tier 3 engine. Better profitability for users is available through the inclusion of the Fuel Saver function on the Tier IV Final/Euromot 4 engine. Life is also made easier for the operator with Manitowoc’s new Crane Control System (CCS) and the new Boom Configurator Mode. The standardised CCS is a user-friendly interface that Manitowoc is featuring on all new crane models. The CCS components and operating software have been specifically designed, developed and tested by Manitowoc engineering and innovation teams worldwide to ensure the highest reliability standards. The highly intuitive Boom Configurator Mode makes it quick and easy to select the optimum boom position for a specific lift. The operator inputs the lift parameters such as radius, load or boom length to be moved and the system calculates the best boom configuration. Once the operator selects the preferred option, the boom automatically extends to the required length. The look of the crane has also been improved with a facelift that includes a new ergonomic carrier cab. As one would expect, trademark features such as the Twin-Lock boom pinning system, Megaform boom shaping and Megatrak independent active suspension, are all included in the new GMK4100L-1. Deliveries of the new, best-in-class GMK4100L-1 will start in quarter three 2016.